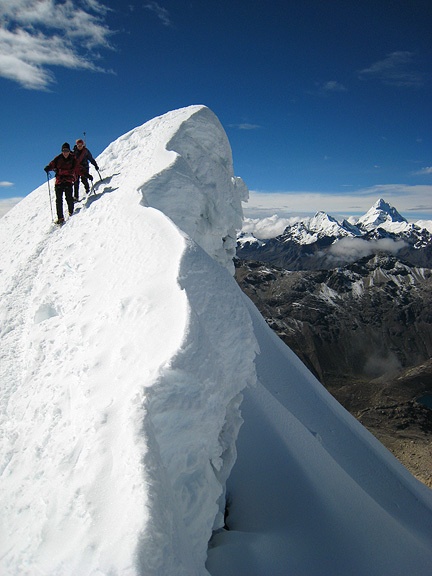 At 20,817 feet, Chopicalqui is a high summit and often technically demanding. On Chopicalqui we will place two camps above Base Camp. On our summit day we will climb a spectacular snow and ice ridge with snow and ice up to 60°. We start our trip in the Ishinca Valley. Quebrada Ishinca is a large valley surrounded by impressive summits. There is big vertical relief here. The upper valley floor, which is wide relatively flat and comforting with its grasslands and stands of Quenual trees, is about 14,000 feet. The surrounding peaks tower to heights of over 20,000 feet for the larger ones, with a greater number in the 18,000 to 19,000 foot range. There are a great variety of summits from which to chose. Because of the general rugged and highly glaciated nature of the Cordillera Blanca, all climbs offer spectacular views and the ambiance is unforgettable. Climbers for this combined program need to be in very good physical condition, and have experience with steep two-tool climbing and glacier travel skills. Previous high altitude experience is recommended, but not required. While both peaks are demanding, Chopicalqui is especially so. The high altitude, occasionally soft snow, and steeper steps require a high level of fitness and endurance. A visit to Cuzco and Machu Picchu just before this expedition is a great way to start your acclimatization. This is a strenuous trip. The challenges start with our climbs in the Ishinca area. Though we use this part of the program partly as acclimatization, the peaks in this area should not be underestimated. Tocllaraju, at 19,785 feet is especially demanding, requiring two-tool climbing and several belayed pitches, some just at the summit. 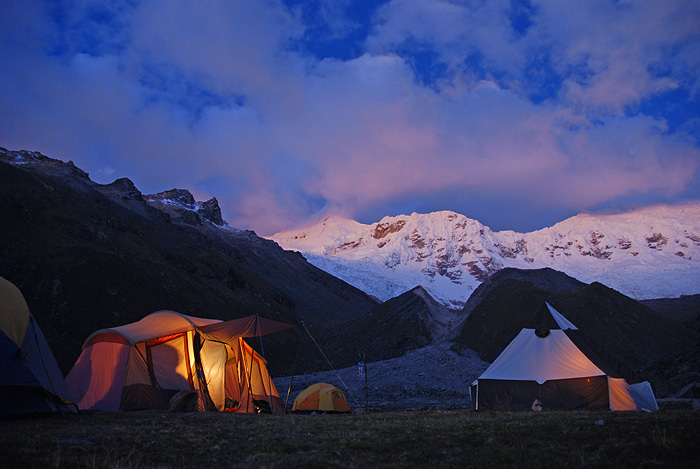 Chopicalqui is usually technically similar to Tocllaraju, but higher in altitude. Some years, in fact, a very steep wall must be climbed quite close to the summit. In 2004, it was possible to easily go around this wall, but in recent past years, that has not been the case. Lower on the route we will also be doing the odd pitch here and there of steep, belayed climbing. We will need to use two ice tools for these sections. but perhaps the main challenge of Chopicalqui is the occasional deep snow which is often found on this side of the peak. This is an aerobic challenge and can be quite a difficult one. Be fit! Climbers need to be in excellent physical condition, and have experience climbing in crampons. They should be comfortable following on slopes up to 60 degrees in steepness. Previous high altitude experience is recommended, but not required. Descending to Moraine Camp after a successful climb. Fly to Lima. 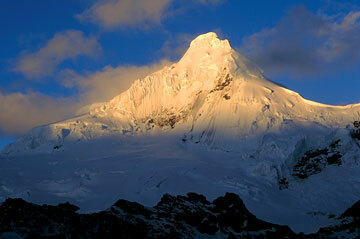 Most climbers take a late night flight out of Miami, arriving in Lima very early in the morning the next day. Arrive early AM in Lima. We recommend you plan on spending this day in Lima. This gives you an opportunity to rest, explore a bit of the city and deal with delayed baggage if necessary. An even better idea is to visit the amazing archeological sites at Machu Picchu and around Cuzco prior to the expedition. Not only is a fascinating, but it will help jump-start your acclimatization. Van to Huaraz. We'll have a private van for our journey to Huaraz. The trip to Huaraz takes most of the day. We usually arrive just in time to see the setting sun on the peaks at the southern end of the Blanca. On arrival we check into our hotel, the Hostal Andino, generally agreed to be the finest hotel in Huaraz. Laguna Churup day hike. In order to begin our acclimatization and to give ourselves a bit of a rest from traveling we take a short day hike to Laguna Churup. This azure colored glacial fed lake nestled under 18,017 foot Nevado Churup, is not far from Huaraz. At about 14,600' in elevation, Laguna Churup is an excellent destination to help us begin the process of adapting our bodies to the demands of high altitude climbing. Return to Hostal Andino for the night. Leaving Huaraz early we drive a short way north, downstream in the Callejón de Huaylas, the large valley that borders the Cordillera Blanca on its west side. Soon we turn east and climb up to the town of Pashpa. From here, we load our equipment on burros and begin the easy trek into Base Camp. The trek normally takes only about 5 hours. This is a lovely walk, passing through dense forests of Quenual trees before emerging into the upper broad valley where we will establish our base camp at about 14,000 feet. This will be our home for the next 10 days, and other than the high camps we may elect to place during our ascents around the valley we will get to enjoy the relative comfort of of a well equipped cooking tent and Emilio's superb cooking talents. Our first order of business is to become better acclimated to the higher altitudes of they area. We normally begin our stay with an easy walk, exploring the valley. Ishinca, a 18,138 foot peak, and perhaps technically the most straightforward in the valley. It is still a big climb, however, involving glacier travel and a significant elevation gain above our base camp. Urus, 17,778 feet, is another great peak, involving somewhat steeper climbing, especially on the summit structure. Tocllaraju, a large summit at the head of the valley. This is the most demanding of the three climbs mentioned here and required a high camp before reaching its 19,785 foot high summit. On Tocllaraju we will put all of our skills to the test, climbing steep belayed pitches on the upper part of the climb. We make an early morning departure on our hike out. Again, with our heavy gear on burros we are able to enjoy the trek back to Pashpa carrying only day packs. Normally we arrive out at the road in early afternoon. After purchasing a bottle or two of pop, or beer if you're inclined, we load up our waiting van and head back out to Huaraz. After a hot shower, its down into town for a celebratory dinner. Leaving Huaraz early, we drive into famous Quebrada Llanganuco, a narrow canyon between Huascarán to the south and the Huandoy peaks to the north. The van drops us off at about 13,800 feet (4200 meters) and with the help of porters, we make the short trek to Base Camp. Because Base Camp is quite close to the road, only 30 minutes away, we'll continue onto Moraine camp located at the edge of the glacier at near 16,100 feet (4900 meters). Pisco Oeste and Este as seen from Moraine Camp. We gain the glacier a short way above camp and climb about 1500 feet to our High Camp just below a high col between Chopicalqui and Huascarán. On summit day we climb steeply above the col and follow the long summit ridge to the top. The climbing involves occasional belayed climbing on ice and snow up to 60°. Every year this route is a bit different. Occasionally some very steep climbing is required just below the summit. After our climb we'll descend either back to High Camp, or perhaps down to Moraine Camp. We continue our descent, meeting our van at the trail head and return to Huaraz. We return to Lima via our van, departing Huaraz in the mid-morning. Usually we have time to enjoy a good final meal together and have plenty of time to get to the airport for the late evening departures for the States. Most flights leave Lima for the US in the very late evening, arriving in the USA about 5 or 6 in the morning. High on Chopicalqui, looking down into Quebrada Ulta to the south.